provides an initial step toward a habitat conservation strategy for the Gulf of Maine, which will be developed in partnership with organizations around the Gulf. The primer is available now for downloading in printer-friendly PDF format. Click the links below to download the primer. Printed copies of the primer are available. To request a copy, please email or call the contacts listed below. The Gulf of Maine contains rich habitats that are affected by many human activities. The 56-page Gulf of Maine Marine Habitat Primer provides an overview of the Gulf of Maine’s coastal and offshore habitats for resource managers and other coastal decision-makers in government, NGOs, and the private sector. Beautifully illustrated with color photographs and drawings, the primer describes habitat characteristics, ecological functions, economic and recreational values, human impacts, and management considerations. The primer is intended as a useful tool for resource managers, planners, legislators, conservation commissioners, NGO staff members, and other people seeking a better understanding of marine habitats from Massachusetts to Nova Scotia. The primer is a collaborative project of the Habitat Conservation Subcommittee and the Science Translation Project. 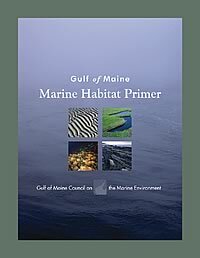 Download the Gulf of Maine Marine Habitat Primer in printer-friendly PDF format by clicking the following links.